We’ve seen this before. Misinformation campaigns designed to stop a neighborhood from achieving “Historic Neighborhood” designation. It happened when John S. Park Neighborhood was applying, and it’s happening again…..this time at the Westleigh Neighborhood. 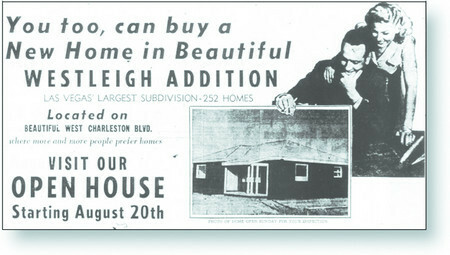 Westleigh was built between 1952 and 1955, and was labeled at the time (see the ad) as “Las Vegas’ LARGEST subdivision – 252 homes”. Westleigh is the 4 north south streets to the east of Valley View, between Oakey and Charleston. The Westleigh Neighborhood Association has spent 3 years working on obtaining Historic Neighborhood Designation. One of their representatives sent me this note, and asked me and my readers for some help. Specifically, we’d like to hear from those of you in John S. Park Historic Neighborhood. Will you use the comments section for this post to tell us your experience with living in a designated Historic Neighborhood. We need your comments to share with the Westleigh Homeowners that are being manipulated with fear tactics from the opposition. This Thursday night is the Westleigh neighborhood meeting for the historic designation. It is at 6 p.m. at <?xml:namespace prefix ="" st1 ns ="" "urn:schemas-microsoft-com:office:smarttags" />Vegas Verdes Elementary School (4000 El Parque Ave. on Oakey, west of Valley View). A front porch meeting will also be held on October 31 at the intersection of Melville and Ashby from 9 a.m. to noon. A petition in support of this designation will be available for everyone to sign. The Planning Commission told the Westleigh neighborhood to have these meetings in order to correct some misinformation that has spread throughout the neighborhood. People were told having a historic designation would lower their property values, the Historic Commission would act as an HOA and residents would need approval just to plant a rose bush. In fact, many papers have been written showing that values don’t decrease and in most cases, they increase. The Historic Commission would not be an HOA, no dues would be paid. Alterations not requiring a permit are allowed so you can still plant a rose bush. The Westleigh Historic designation will be heard at the Planning Commission’s November 5, 2009 meeting. The Westleigh neighborhood needs your support. Please try to attend any of the meetings, call or email your City Council members (http://www.lasvegasnevada.gov/Government/council.htm), post comments on Jack’s blog, etc. to support the hard work the Westleigh neighborhood has done over the past three years to achieve this historic designation. I’ve also attached some information about what the historic designation would mean to the Westleigh neighborhood. Southridge, Beverly Green and other neighborhood associations are currently in the planning stages for Historic Designation as well. Let’s build the case now, and keep this from happening in the future as well. If you want a really good read, here’s the Westleigh Neighborhood Historic Resource Survey that was conducted to guide the city as to whether Westleigh should be eligible. Here’s the actual City of Las Vegas Historic Designation ordinance and the official FAQ brochure on Historic Preservation from the City of Las Vegas. Here’s a flyer that’s being sent to Westleigh residents to help get out the truth. Hearing it from John S. Park residents as well, would be a big help. Have you heard things you’re not sure are accurate? Are you concerned about the effects an historic designation may have? Do you have questions you’d like answered from an official source? TRUE . . . . .
FALSE . . . . .